God Almighty first planted a Garden; and, indeed, it is the purest of human pleasures; it is the greatest refreshment to the spirits of man; without which buildings and palaces are but gross handy-works: and a man shall ever see, that, when ages grow to civility and elegancy, men come to build stately, sooner than to garden finely; as if gardening were the greater perfection. I do hold it in the royal ordering of Gardens, there ought to be Gardens for all the months in the year, in which, severally, things of beauty may be then in season. For December, and January, and the latter part of November, you must take such things as are green all winter: Holly, Ivy, Bays, Juniper, Cypress-trees, Yew, Pineapple-trees; Fir-trees, Rosemary, Lavender; Periwinkle, the white, the purple, and the blue; Germander, Flags, Orange-trees, Lemon-trees, and Myrtles, if they be stoved; and Sweet Marjoram, warm set. There followeth, for the latter part of January and February, the Mezereon-tree, which then blossoms: Crocus Vernus, both the yellow and the gray; Primroses, Anemones, the early Tulip, the Hyacinthus Orientalis, Chamairis Fritellaria. For March, there come Violets, especially the single blue, which are the earliest; the yellow Daffodil, the Daisy, the Almond-tree in blossom, the Peach-tree in blossom, the Cornelian-tree in blossom, Sweet-Briar. In April follow the double white Violet, the Wallflower, the Stock-Gffliflower, the Cowslip, Flower-de-Luces, and Lilies of all natures; Rosemary-flowers, the Tulip, the double Peony, the pale Daffodil, the French Honeysuckle, the Cheery-tree in blossom, the Damascene and Plum-trees in blossom, the White Thom in leaf, the Lilac-tree. In May and June come Pinks of all sorts, specially the Blush-Pink; Roses of all kinds, except the Musk, which comes later; Honeysuckles, Strawberries, Bugloss, Columbine, the French Marygold, Flos Africanus, Cherry-tree in fruit, Ribes, Figs in fruit, Rasps, Vine-flocvers, Lavender in flowers, the sweet Satyrian, with the white flower; Herba Muscaria, Lilium, Convallium, the Apple-tree in blossom. In July come Gillyflowers of all varieties, Musk Roses, the Lime-tree in blossom, early Pears, and Plums in fruit, Genitings, Codlins. In August come Plums of all sorts in fruit, Pears, Apricots, Barberries, Filberts, Musk-Melons, Monks-hoods, of all colours. In September come Grapes, Apples, Poppies of all colours, Peaches, Melocotones, Nectarines, Cornelians, Wardens, Quinces. In October, and the beginning of November, come Services, Medlars, Bullaces, Roses cut or removed to come late, Hollyoaks, and such like. These particulars are for the climate of London; but my meaning is perceived, that you may have ver perpetuum, as the place affords. And because the breath of flowers is far sweeter in the air (where it comes and goes, like the warbling of music), than in the hand, therefore nothing is more fit for that delight, than to know what be the flowers and plants that do best perfume the air. Roses, damask and red, are fast flowers of their smells; so that you may walk by a whole row of them, and find nothing of their sweetness; yea, though it be in a mornings dew. Bays, likewise, yield no smell as they grow, Rosemary little, nor Sweet Marjoram; that which, above all others, yields the sweetest smell in the air, is the Violet, especially the white double Violet, which comes twice a year, about the middle of April, and about Bartholomew-tide. Next to that is the Musk-Rose; then the Strawberry leaves dying, with a most excellent cordial smell; then the flower of the Vines, it is a little dust like the dust of a Bent, which grows upon the cluster in the first coming forth; then Sweet-Briar, then Wallflowers, which are very delightful to be set under a Parlour or lower chamber window; then Pinks and Gillyflowers, specially the matted Pink and Clove Gillyflower; then the flowers of the Lime-tree; then the Honeysuckles, so they be somewhat afar off. Of Bean-flowers I speak not, because they are field-flowers; but those which perfume the air most delightfully, not passed by as the rest, but being trodden upon and crushed, are three; that is, Burnet, Wild Thyme, and Water-Mints; therefore you are to set whole alleys of them, to have the pleasure when you walk or tread. For Gardens (speaking of those which are indeed prince-like, as we have done of Buildings), the contents ought not well to be under thirty acres of ground, and to be divided into three parts; a Green in the entrance, a Heath, or Desert, in the going forth, and the main Garden in the midst, besides alleys on both sides; and I like well, that four acres of ground be assigned to the Green, six to the Heath, four and four to either side, and twelve to the main Garden. The Green hath two pleasures: the one, because nothing is more pleasant to the eye than green grass kept finely shorn; the other, because it will give you a fair alley in the midst, by which you may go in front upon a stately hedge, which is to enclose the garden: but because the alley will be long, and in great heat of the year, or day, you ought not to buy the shade in the Garden by going in the sun through the Green; therefore you are, of either side the Green, to plant a covert alley, upon carpenters work, about twelve foot in height, by which you may go in shade into the Garden. As for the making of knots, or figures, with divers coloured earths, that they may lie under the windows of the house on that side which the Garden stands, they be but toys; you may see as good sights many times in tarts. The Garden is best to be square, encompassed on all the four sides with a stately arched hedge; the arches to be upon pillars of carpenters work, of some ten foot high, and six foot broad, and the spaces between of the same dimension with the breadth of the arch. Over the arches let there be an entire hedge of some four foot high, framed also upon carpenters work; and upon the upper hedge, over every arch, a little turret, with a belly enough to receive a cage of birds: and over every space between the arches some other little figure, with broad plates of round coloured glass gilt, for the sun to play upon: but this hedge I intend to be raised upon a bank, not steep, but gently slope, of some six foot, set all with flowers. Also I understand, that this square of the Garden should not be the whole breadth of the ground, but to leave on either side ground enough for diversity of side alleys, unto which the two covert alleys of the Green may deliver you; but there must be no alleys with hedges at either end of this great enclosure; not at the hither ends for letting your prospect upon this fair hedge from the Green; nor at the farther end, for letting your prospect from the hedge through the arches upon the Heath. 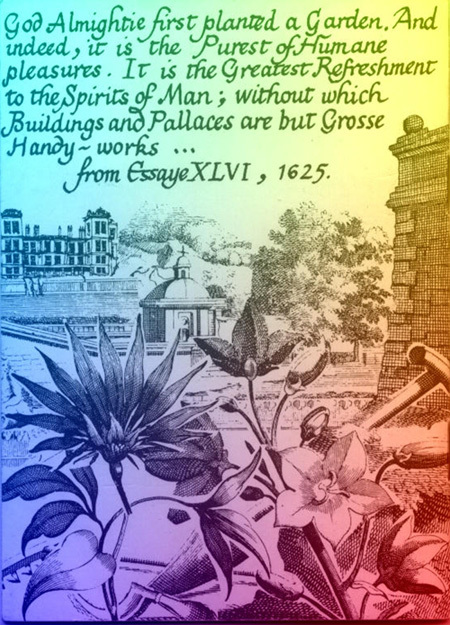 For the ordering of the ground within the great hedge, I leave it to variety of device; advising, nevertheless, that whatsoever form you cast it into first, it be not too bushy, or full of work; wherein I, for my part, do not like images cut out in Juniper or other garden stuff; they be for children. Little low hedges, round like welts, with some pretty pyramids, I like well; and in some places fair column, upon frames of carpenters work. I would also have the alleys spacious and fair. You may have closet alleys upon the side grounds, but none in the main garden. I wish also, in the very middle, a fair mount, with three ascents and alleys enough for four to walk abreast; which I would have to be perfect circles, without any bulwarks or embossments; and the whole mount to be thirty foot high; and some fine banqueting house with some chimneys neatly cast, and without too much glass. For Fountains, they are a great beauty and refreshment; but Pools mar all, and make the Garden unwholesome, and full of flies and frogs. Fountains I intend to be of two natures; the one that sprinkleth or spouteth water: the other a fair receipt of water, of some thirty or forty foot square, but without fish, or slime, or mud. For the first, the ornaments of images, gilt or of marble, which are in use, do well: but the main matter is so to convey the water, as it never stay, either in the bowls or in the cistern: that the water be never by rest discoloured, green, or red, or the like, or gather any mossiness or putrefaction; besides that, it is to be cleansed every day by the hand: also some steps up to it, and some fine pavement about it doth well. As for the other kind of Fountain, which we may call a bathing-pool, it may admit much curiosity and beauty, wherewith we will not trouble ourselves: as, that the bottom be finely paved, and with images; the sides likewise; and withal embellished with coloured glass, and such things of lustre; encompassed also with fine rails of low statues: but the main point is the same which we mentioned in the former kind of Fountain; which is, that the water be in perpetual motion, fed by a water higher than the pool, and delivered into it by fair spouts, and then discharged away underground, by some equality of bores, that it stay little; and for fine devices, of arching water without spilling, and making it rise in several forms (of feathers, drinking-glasses, canopies, and the like), they be pretty things to look on, but nothing to health and sweetness. For the Heath, which was the third part of our plot, I wish it to be framed as much as may be to a natural wildness. Trees I would have none in it, but some thickets made only of Sweet-Briar and Honeysuckle, and some Wild Vine amongst; and the ground set with Violets, Strawberries, and Primroses; for these are sweet and prosper in the shade; and these to be in the Heath here and there, not in any order. I like also little heaps, in the nature of mole-hills (such as are in wild Heaths), to be set, some with Wild Thyme, some with Pinks, some with Germander, that gives a good flower to the eye; some with Periwinkle, some with Violets; some with Strawberries, some with Cowslips, some with Daisies, some with Red Roses, some with Lilium Convallium, some with Sweet-Williams red, some with Bears-Foot, and the like low flowers, being withal sweet and sightly; part of which heaps to be with standards of little bushes pricked upon their top, and part without: the standards to be Roses, Juniper, Holly, Barberries (but here and there because of the smell of their blossom), Red Currants, Gooseberries, Rosemary Bays, Sweet-Briar, and such like: but these standards to be kept with cutting, that they grow not out of course. For the side grounds, you are to fill them with variety of alleys, private, to give a full shade; some of them, wheresoever the sun be. You are to frame some of them likewise for shelter, that when the wind blows sharp, you may walk as in a gallery: and those alleys must be likewise hedged at both ends, to keep out the wind; and these closer alleys must be ever finely graveled, and no grass, because of going wet. In many of these alleys, likewise, you are to set fruit-trees of all sorts, as well upon the walls as in ranges; and this should be generally observed, that the borders wherein you plant your fruit-trees be fair, and large, and low, and not steep; and set with fine flowers, but thin and sparingly, lest they deceive the trees. At the end of both the side grounds I would have a mount of some pretty height, leaving the wall of the enclosure breast-high, to look abroad into the fields. For the main Garden I do not deny but there should be some fair alleys ranged on both sides, with fruit-trees, and some pretty tufts of fruit-trees and arbours with seats, set in some decent order; but these to be by no means set too thick, but to leave the main Garden so as it be not close, but the air open and free. For as for shade, I would have you rest upon the alleys of the side grounds, there to walk, if you be disposed, in the heat of the year or day; but to make account that the main Garden is for the more temperate parts of the year, and in the heat of summer for the morning and the evening or overcast days. For Aviaries, I like them not, except they be of that largeness as they may be turfed, and have living plants and bushes set in them; that the birds may have more scope and natural nestling, and that no foulness appear in the floor of the aviary. So I have made a platform of a princely Garden, partly by precept, partly by drawing; not a model, but some general lines of it; and in this I have spared for no cost: but it is nothing for great princes, that for the most part, taking advice with workmen, with no less cost set their things together, and sometimes add statues and such things, for state and magnificence, but nothing to the true pleasure of a Garden.